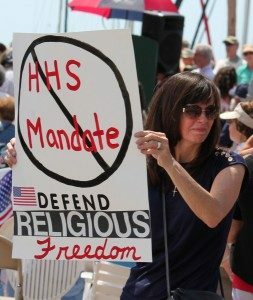 As many are aware, the U.S. Department of Health and Human Services (HHS) issued a mandate that requires health insurance companies, even those paid by religious organizations, to provide abortion-inducing drugs, sterilization and contraception for “free.” The United States Conference of Catholic Bishops, members of other faith traditions, the attorneys general of 11 states, and others have adamantly opposed the HHS mandate and has called it a violation of religious liberty and freedom of conscience. HHS Mandate and Supreme Court Decision: The U.S. Supreme Court’s decision upholding the healthcare reform law does not affect lawsuits related to religious liberty surrounding the HHS Mandate, which requires most religious employers to provide contraceptives, including some abortion-causing drugs, and sterilization to their employees. Those cases are still in lower courts and have not yet reached the Supreme Court. The decision of the Supreme Court neither diminishes the moral imperative to ensure decent health care for all, nor eliminates the need to correct the law’s fundamental flaws.